The Grand Bruichladdich Distillery Tasting for Women Only! "Wine Matured Whiskies" The Festival was very pleased to have Mr. Andrew Gray of Bruichladdich Distillery, Isle of Islay, Scotland lead the lucky attendees through the single malts of this worldwide renowned distillery. The evening featured a variety of Wine Matured Islay Single Malt Whiskies. According to Mr. Gray, this may well have been the first women-only tasting ever, world-wide. "What's in the Cask?" Our second Grand Tasting, also held on the Friday evening, featured the single malts of the famed independent bottler Murray McDavid and examined the theme of "What's in the Cask?" and the ACE Program; Additional Cask Evolution. This tasting featured a range of limited edition single malts from distilleries seldom seen in British Columbia. Some of the casks these whiskies were finished in included Grenache Blanc, Guigal Condrieu Viognier, Guigal Marsanne, Rioja and Port. The event was led by Ted Latimer of Murray McDavid. The Grand Bruichladdich & Murray McDavid Tastings were held concurrently on Friday evening. 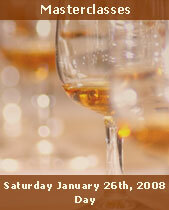 This event was a single malt field trip to Winchester Cellars in Saanich, Vancouver Island's first working Distillery. Participants had the opportunity to see, smell, and taste an actual run of single-malt whisky as it trickled through the gleaming copper pot still. The art of making the crucial cuts to the heads, hearts and tails of the new-make spirit was observed. Ken Winchester, a winemaker for 20 years, has studied distilling at Michigan State and at Bruichladdich Distillery in Islay, Scotland. He led a unique, hands-on session in artisan whisky making, from wash to barrel. Participants were taken by mini-bus departs from the Grand Pacific Hotel and were returned to the hotel by 12:30pm in time for the afternoon masterclasses. This year we were very pleased to offer in the afternoon two masterclasses featuring the Independent Bottlers A. Dewar Rattray & Douglas Laing. Independent Bottlers generally do not own distilleries and buy casks of whisky on the open market, bottling them under their own name. The range of whiskies featured distilleries that are rarely seen in British Columbia, and additionally featured single malts from closed or silent distilleries. With Alistair Walker of BenRiach Distillery, Scotland. Dating back to 1898 and located in the 'Heart of Speyside', the BenRiach Distillery became independent in 2004. Previously undiscovered, the distillery is now enjoying a new lease of life. With access to an impressive inventory of maturing whiskies dating back as far as 1966, the range of expressions is varied both in terms of age and style, including classic Speyside, special 'finishes', heavily peated BenRiach and single cask vintage bottlings. The BenRiach masterclass revealed the secrets of BenRiach Distillery and provided an opportunity to experience the diversity of expressions and styles of BenRiach Single Malt. MASHING IT UP! TULLIBARDINES APPROACH...James Cowan of Tullibardine Distillery in Blackford, Perthshire, Scotland led attendees through the single malts of this recently independent distillery. Participants were able to discover the gems that have lain silently maturing in their warehouses for many, many years. 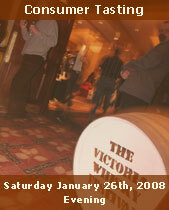 The 2008 Victoria Whisky Festival was the official launch into British Columbia of Tullibardine Distillery, and this class included a live practical insight into some of their practices. Richard Cmajdalka, Sommelier and Territory Manager for Charton Hobbs led an informal and entertaining class on the production of Scotch and American Whiskey. Geared toward the novice whisky drinker, it also included a segment on whisky tasting. Featuring the Whiskies of Glenmorangie, Ardbeg, Glenrothes, Cutty Sark, Jack Daniels' and Woodford Reserve, this was not a class to miss! The Douglas Laing masterclass featured a stunning range of older single cask bottlings from active and closed distilleries. Single cask bottlings are a rarity and Douglas Laing is one of the premier bottlers of such product. The attendee enjoyed a whisky of superb quality, age and distinction. Bob Kyle of Rare Drams led the Master Class, as he introduced whiskies from the single casks of the highly respected Independent bottler Douglas Laing. Tastings included examples from Scotland's lost distilleries, and a dram or two from the old & rare collection. The Famous Grouse: "Famous" for good reasons, this is one of the most recognized blended Scotch whisky brands in the world of whisky. This class was led by the Brand Ambassador and featured the super premium single malts that constitute the Famous Grouse; Macallan and Highland Park, in the range of 18, 25 and 30 years old! This masterclass was a must for the person who enjoys diversity in the taste, nose and balance of whisky. The Famous Grouse is the best selling blended Scotch whisky in Scotland. "Bruichladdich Distillery Company Collectables" Andrew Gray of Bruichladdich Distillery led attendees through the collectable single malts from this Islay distillery. The distillery is increasingly well known for its very small bottlings runs featuring varied and unusual expressions, much sought after by collectors. A very memorable tasting. Susan Webster of A. Dewar Rattray Independent bottlers led attendees through the company's excellent line of single cask bottlings. The Dewar Rattray line features a variety of ages from active and silent distilleries, including single cask bottlings. This is the famous distillery that commenced legal distilling in 1824 in the area of Speyside in Scotland. In the time before 1824 there were up to 200 illicit distilleries in the area but the Glenlivet was the first to commence legal distilling with a government license. The distillery has over 80,000 casks of whisky maturing in warehouses on site. Attendees were able to sample some rare and exquisite bottlings from this legendary distillery. The Festival was very pleased to offer the very first masterclass dedicated to the whiskies of Ireland. Featuring John Cashman, Global Brand Ambassador from Cooley Distillers which is the only independent Irish whiskey distillery in Ireland. Irish whiskey is gaining stature around the world; the whiskies in this class were no exception and Cooley Distillers were pleased to present their Award winning range of single malts - Tyrconnell and Connemara - along with the recently introduced Greenore Single Grain whiskey. The Johnnie Walker family of whiskies is known around the world for their quality and flavour; the entire award winning range of Red Label, Black Label, Green Label, Gold Label and the very rare Blue Label were sampled and enjoyed. This masterclass was led by Mike Nicolson, retired master distiller who managed many of the distilleries that contribute to the exceptional taste of the Johnnie Walker family of whiskies. Some of the Johnnie Walker blends contain up to 40 different single malts; this very informative and amusing masterclass allowed them all to be enjoyed. From Scotland's Distillery of the Year 2007, Douglas Davidson presented several crackerjack, award winning whiskies including their new Tokaji Cask Finish and one other new finish, never before seen in Canada. Once again our friends from the Society are returned to Victoria. 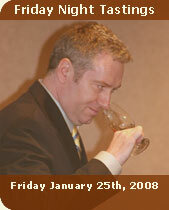 This class featured a variety of the famed Society single cask malts with Alan Shayne, president of the SMWSA. The SMWS bottles and resells to its members single malt whiskies from single casks, at cask strength from active and silent distilleries. Inver House Distillers were delighted that once again renowned whisky journalist, Jim Murray hosted the Masterclass at the 2008 Victoria Whisky Festival. With 5 highly regarded distilleries, Jim introduced a selection of their award-winning single malts which are featured in his new 2008 Malt Whisky Bible plus their Catto's Blended Scotch Whisky and the original Scottish cream liqueur, Heather Cream. As in previous years, participants were informed and entertained. Ambassador Ryan Powell led an exploratory journey through some of the exceptional single malts that contribute to Chivas Regal blended scotch whisky, Longmorn and Strathisla. Additionally the 12 year old and the 18 year old expressions of this award winning Scotch whisky were appreciated by the lucky participants, as was the 21 year old Royal Salute. 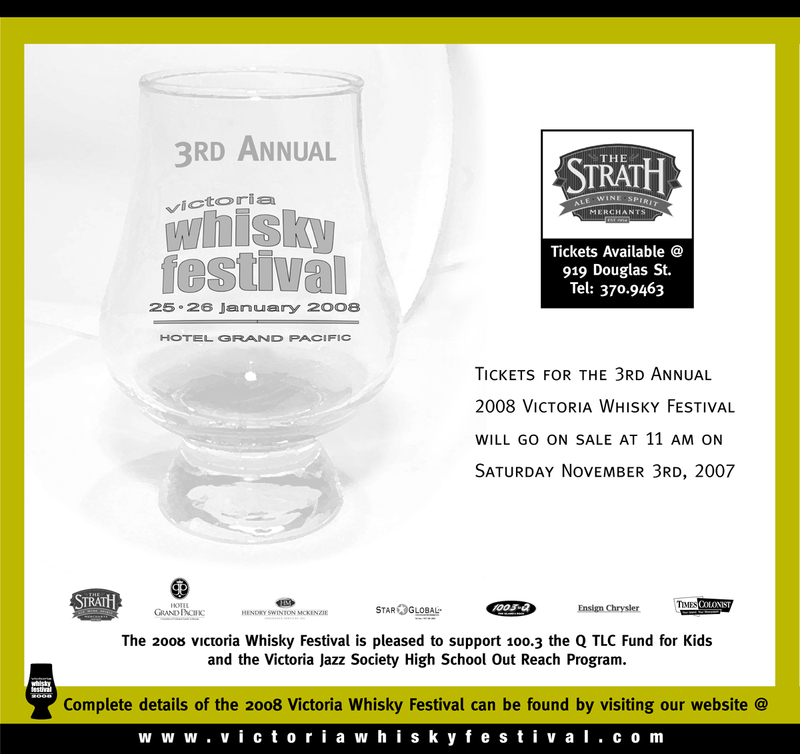 The Media, Sponsor & VIP Tasting was open to special guests of the 2008 Victoria Whisky Festival and VIP Ticket holders. It was held in the Vancouver & Pender Island Ballrooms prior to the Consumer Tasting and featured the same full line of whiskies as the Consumer Tasting. VIP Ticket holders were able to explore the range of whiskies being presented for a full hour prior to the Consumer Tasting. (Ticket price includes VIP Tasting & Consumer Tasting - 6:00pm to 7:00pm and 7:00pm to 10:00pm). The heart of the Festival is the Consumer Tasting, held in the Hotel Grand Pacific's Pender Island and Vancouver Island Ballrooms. The event featured a myriad of distilleries and whiskies including Canadian whisky, Scottish single malts and blended whiskies, Irish whiskey and a variety of whisky & whiskey styles from the United States of America. Attendees had their choice of over 100 whiskies for their enjoyment. Each attendee was provided with an engraved Glencairn whisky nosing & tasting glass, a Festival program, a Malt Advocate whisky magazine and assorted product information. The Hotel Grand Pacific provided the best Hors d'Oeuvres from their award winning kitchen and chefs using local ingredients, including the very popular & elusive haggis tarts created especially for the Victoria Whisky Festival! Event ticket holders were able to enjoy the largest selection of whiskies ever assembled for such an event in British Columbia. The Hotel Grand Pacific's Executive Chef Rick Choy paired exceptional local ingredients with the single malts from the Tullibardine Distillery located in Blackford, Perthshire, Scotland. This exceptional evening, in the highly acclaimed The Mark restaurant, featured single malts dating as far back as 1966. 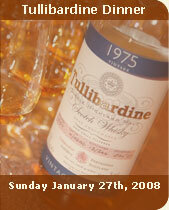 Each of the Tullibardine single malts featured at the dinner were used in the preparation of the accompanying course. James Cowan, from the distillery, kept the participants entertained and informed during the course of the dinner. It was an unforgettable experience.